Barrier-based publishers have been shouting and stomping around a lot recently. Kind of like a Vogon guard. But we’re trying to see the situation from their point of view. FORD looks up and pats the GUARD on the arm reassuringly. FORD: And shouting, sure, and he doesn’t even know why he’s doing it! GUARD: But all right, then, what’s the alternative? FORD: Well … stop doing it, of course! Tell them you’re not going to do it any more. FORD looks at ARTHUR for help, who stares back blankly. GUARD: Eerrrrrrrrrrrrmmmm…erm, well, that doesn’t sound great to me. — Douglas Adams, The Hitch-Hiker’s Guide to the Galaxy. Here’s the thing. 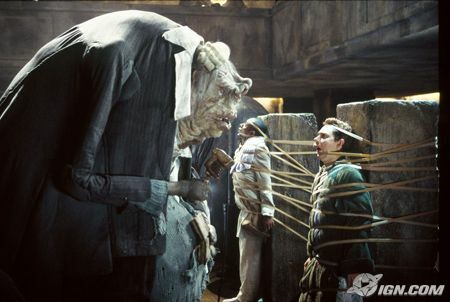 The alternative we want from barrier-based publishers is that they stop being Vogon guards. We’re not interested in helping them find better ways to be barrier-based publishers, because that whole model is obsolete, destructive, inimical to the connected world we now live in and completely unacceptable in the 21st Century. Reducing prices a bit would be nice, yes; but nowhere near the revolution that the world actually needs. So the whole question about Elsevier, for me at least, comes down to this. Can they stop being Vogon guards? Can they find a business model that isn’t based on stamping around, throwing people off spaceships and shouting? We know that there are viable non-Vogon business models out there, because PLoS is doing very nicely. But because PLoS isn’t taking in enough money to cream off 36% of all revenue as profit, it seems likely that Elsevier’s response is going to be “Eerrrrrrrrrrrrmmmm…erm, well, that doesn’t sound great to me.” Especially as the evidence suggests that Elsevier can’t compete on a level playing-field with the likes of PLoS anyway. A couple of people have complained that we’re writing too much about Open Access recently and not enough about sauropods. I am sympathetic to that; no-one could wish more than I do that publishing would just sort itself out and we could get back to doing what we love best. But until that happens, anyone who wants to read more about the ongoing scholarly revolution might find it useful to read my Twitter feed (@SauropodMike). You don’t need an account to see it. I for one am cool with the discussion/rants about restricted access research. So don’t stop on account of myself. As a hobbist palaeo-artist one of the biggest restrictions and challenges I have is doing proper research, so I don’t continue memes or create a false reconstruction. During the day I’m an elementary school teacher, so I have no access whats so ever to academic literature (except all the cool new stuff coming out of PLoS and the other new free access journals). Even just from my job’s point of view, my task of science education would be made so much easier if I had direct access to what scientists are saying rather than having to rely on second or third hand rewrites of those same papers. I wish to second Traumador. As a former employee for a large corporation, I find discussion of corporate greed and spin to be entertaining, and as someone who Elsevier apparently feels doesn’t need access to science (i.e. a non-millionaire who doesn’t attend or work at a university) I find discussion of publishers’ horrible practices to be necessary. Thanks, Traumador and Mickey. One of the major points of this is that closed access hurts everyone, not just degreed scientists with institutional affiliations. Mike and I can keep saying that, but it carries a lot more weight coming from the teachers, artists, avocationalists, and other members of the general public. So we’re grateful for your input. To everyone else, whether you agree with us or not: the comment field is open. Let’s talk. I hesitate to post, because wile I’ve made my position elsewhere, I do support the efforts SV-POW! makes towards this goal of rightness in OA. I think the best course of action regarding Elsevier is to boycott and bring your “business” elsewhere, a process by which capitalism thrives in a way through competition — especially if that competition does what Elsevier offers, but for free! I support the offer of asking Elsevier to change its methods, but I do not think it will without major influence from its shareholders, who serve to lose a lot of money if they did. Has SV-POW! drifted heavily from its core mission? If its mission were only to show things about sauropods, I’d say “yes,” but if it’s actually about Science, and communication, something it seems I think BOTH Matt Wedel (a teacher) and Mike Taylor are interested in. In this way, i think SV-POW! is doing exactly what it should be doing. You’re exactly right that boycotting Elsevier (for me anyway) is more like boycotting BP and buying my petrol from Shell than it is like boycotting Apple and making do without an iPad. I’m just taking my business elsewhere — and like a lot of other signatories, that’s a decision I made some time ago, so that signing was only making public what I’d already actually done.